Oreganol moisturizing cream is a powerful rejuvenating formula containing propolis, wild essential oils, and wild honey. Ideal for all skin types, Oreganol cream is made with the highest-ranked antioxidants in the world. 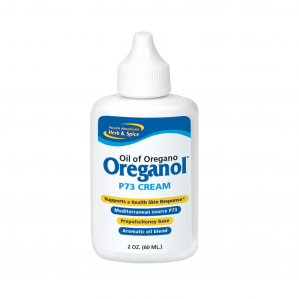 Oreganol cream has proven antiseptic power that cleanses the skin and is great for fine lines, wrinkles, skin disorders, dry/chapped skin, bug bites, burns, cuts, abrasions, sunburn, warts, skin lesions, and more. Directions: Apply Topically as a moisturizing, rejuvenating cream. For best results use daily. Avoid contact with eyes. Ingredients: Purified water, Canadian wildflower honey, propolis, royal jelly, St. Johns wort oil, wild oil of oregano P73, wild lavender oil, wild myrtle oil, extra virgin olive oil, and pure essence of Canadian balsam.